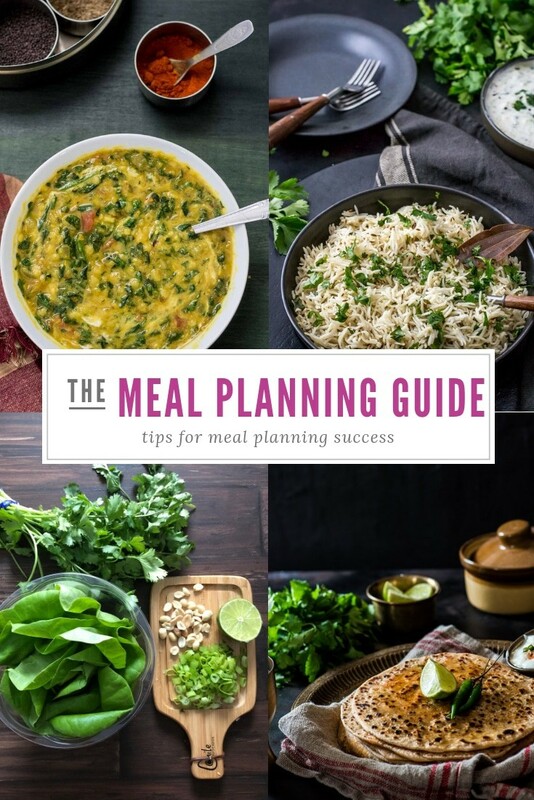 Meal planning 101 – Check out this essential guide to meal planning to learn all the tips that’ll take the stress of out of making homecooked meals. If you prefer eating homemade meals to frozen food, this meal prepping and planning guide is for you. Learn all the tips and tricks that’ll make cooking weeknight meals a breeze. Labor being affordable in India meant most middle-class families would have maids who were available to cook or at least help with chopping vegetables daily. The hot weather made sure that we cooked only as much as needed for the day because food went rancid quickly in spite of refrigeration. When you are used to fresh homemade food, all hell breaks loose when you have to travel abroad for work or studies. There is no one to cook for you, you are pressed for time after having spent long hours at work, commute and not to mention kids’ extracurricular activities. That makes eating fresh homemade every day a distant dream. Having gone through the same grind, I have some tips and tricks for you that’ll get you very close to eating fresh homemade food every day without having to wake up at the crack of dawn. Meal planning can mean different things to different people. For instance, it could mean planning, shopping, prepping and cooking all the meals over the weekend so that you just reheat and serve. The other way of doing it would be to plan, shop and prep over the weekend so that you can churn out fresh meals every day. I prefer the latter because I like the idea of eating fresh food every day. Let’s begin with planning first. Note – I have only discussed dinner options in this post to keep it less overwhelming. Start with one meal a day and once you got the meal planning process figured out for that meal it becomes a lot easier to rinse and repeat for other meals. Create categories such as dals, biryanis, pulses, curries, side dishes, rice dishes, one pot meals. Add your family’s favorite recipes under each category. Load your meals into a meal planning software such as Prepear (affiliate link) and generate your grocery list or you can grab my 4-week meal plan. The other option is to use an excel meal planning template and manually fill it in each week. Check the ingredients against your pantry and make your final shopping list. Here’s a helpful article that will guide you on different ways to efficiently track your pantry items and create a grocery list. I like to meal plan once a month – it takes me less than 30 minutes using Prepear. Grab my 4-week meal plan from here. Grocery shop either late Friday evening or Saturday morning so that you have enough time for your next step – Meal prepping. There are several chores that you can do over the weekend to make weeknight cooking less time-consuming. Here are some of the things that I do over the weekend to plan for the week. Chop vegetables and freeze them – There are plenty of times that we throw our veggies out because we were not able to use them before they start rotting away. Here are my 2 cents – chop and freeze them. Beans, cabbage, cauliflower, okra (bhindi) etc – most veggies freeze well and there is NO impact on the taste when you cook them. I use frozen veggies most of the times for side dishes such as beans poriyal, cabbage poriyal, bhindi do pyaza etc. Make curry sauce – This basic onion-tomato sauce is a life-saver. They store well for a week in the refrigerator (and freeze well too). It is a versatile sauce that you can use it as a base for curries including Makhani gravies, chicken curries, and even dals. Here’s a detailed post on how to make and use curry sauce. Chopped onions – When I am not using curry sauce, I keep a week’s worth of onions chopped in the refrigerator. While the onions are being fried, I use the time to cut tomatoes, mince ginger/garlic etc. Also, it is a rumor that stored onions turn poisonous. Peeled Garlic – You can either buy store-bought peeled garlic (available in Costco or most grocery stores) or peel them over the weekend. Roti dough – Roti dough stays perfectly well in the refrigerator for a couple of days. You can always make extra dough and store it in the freezer. For detail instructions on how to make the perfect roti dough and storage ideas read this post. Homemade ginger garlic paste – I do not like the store bought ginger garlic paste. You can make a big batch of homemade ginger garlic paste at home and refrigerate for a week. If you want to make a bigger batch that would last you a month you can do so by grinding ginger and garlic together and freezing it in an ice-cube tray. Remove the cubed paste and store it in the freezer in a Ziploc bag or a freezer-proof glass container for about a month. Coriander chutney – Make coriander chutney over the weekend. It goes well with most breakfast and snack items and tastes great for a couple of days. If you are making large quantities, store it in the freezer and follow the same process as you would for storing homemade ginger garlic paste in the bullet point above. Storage solutions – You can store your frozen veggies in a freezer-safe Ziploc but my preferred option are these glass containers – safe for you and the environment. Meal planning is supposed to take the stress out of cooking. It is okay if you cannot follow your plan to your T, don’t beat yourself about it. Plan a day where you don’t cook – either eat leftovers or get takeout. Before I sign off, let me quickly mention the meal planning app I use – Prepear. 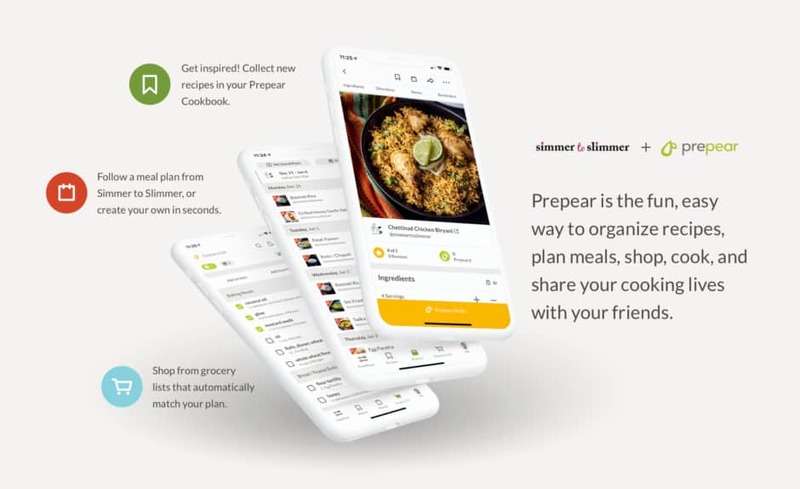 Prepear is an app that allows you to easily organize your recipes, plan your meals, and create your grocery list. While I have my recipes and meal plans on Prepear, you will also find 10,000+ recipe ideas from other bloggers. Meal planning has never been this easy. Find out more at Prepear.com. Have you tried meal planning? If yes, would love to hear your thoughts on what process you follow. Please drop in a note and let me know.